Each year, Western Texas College employees volunteer their time and donate personal funds to raise money for the Scurry County United Way. 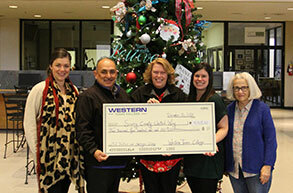 Western Texas College raises funds through two means: the Fall Festival and employee giving. The Fall Festival offers games, candy and prizes for children pre-k through fifth grade at a fall carnival held at The Coliseum. Western Texas College employees donate their time as well as candy, sodas and water. WTC raises funds at this event through admission prices. In addition, employees make contributions through WTC’s Employee Giving program. For United Way’s 2018 giving campaign, Western Texas College raised $4,401.00. The check was presented to United Way on December 13, 2018.